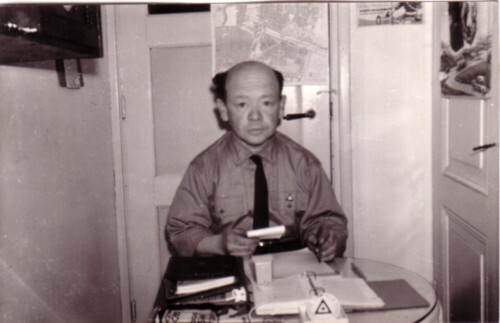 When I was young, I guess between five and ten years old, when my parents visited my grandparents in Amstelveen, we sometimes saw a little man in a uniform directing the traffic in the neighbourhood where my grandparents lived. My brother and me were fascinated by this man, and always when we went to visit our grandparents we hoped to see him. I remember that we called him “Kareltje”, but that was not his real name. We saw him on a road that had the name Karel in it. And I guess my parents made this name up. I remember only very little of him. He was not a policeman, he just dressed up like one, and for some reason the police didn’t mind. There was not much traffic in that area anyway in the mid sixties. I remember seeing him in his uniform late at night in the pouring rain. I was too young to understand it, but I could easily see that there was something unusual with this little man. He probably was a bit retarded. That was for me part of his attraction. When I took a better look at the photo’s at home, I saw that all the photo’s were indeed made in the area where my grandparents used to live. Most of the photo’s are not sharp and they are completely uninteresting , as if they were taken at random. 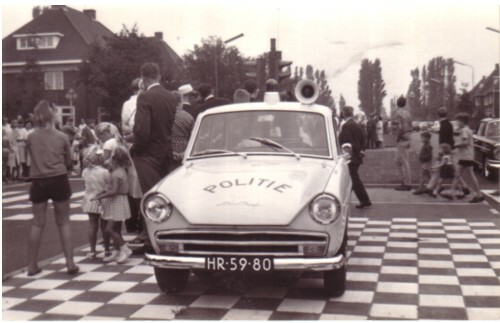 There were some photo’s of police cars. And then I saw a photo with the little man on it, in his home. I was flabbergasted. As if this was all set in scene. I still don’t know what to think of it. Did a part of me hoped or knew that I was buyingKareltje’s archive before the rest of my mind knew it? That is how it felt. There must be a great story in all this, but so far I have not yet found it. Here is the photo of the little man. His name is W. Naberer, by the way. I read that on one of the envelopes in which the photo’s came. Sorry, I have no soundtrack to this story. My family never had much interest in music. My grandparents didn’t even have a record player, I cannot remember them listening to the radio.